Morehouse College’s recent announcement of the retirement of veteran political science professor Dr. Tobe Johnson, Jr. signaled the end of an era for an academic legend. The announcement came as a surprise to some and a reminder to others of the value of long-time cohorts such as Johnson, an 88-year-old Morehouse graduate who has spent nearly 60 years teaching political science at the institution. Dr. Tobe Johnson, Jr. received the Vulcan Teaching Excellence Award at the Morehouse College commencement in 2017. “I’m still hanging in,” Johnson said in a telephone interview this week, noting he is as alert as ever, still drives and has good eyesight – and a sense of politics as solid as the days when he was studying for his Ph.D. in political science at Columbia University in New York in the 1960’s. Johnson was recruited by higher education icon Dr. Benjamin Mays. In the ensuing years, Johnson helped scores of Morehouse men navigate the racial conflict and anti-war protests of the ‘60s and ‘70s in the South. More recently, he has helped students make sense of Black Lives Matter and other current social movements. 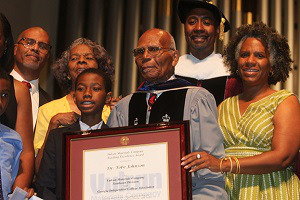 Johnson has learned much over the course of his long academic career and has made his mark in higher education, helping bridge generations of predecessors with the future, said Dr. Alvin Thornton, a retired political science professor at Howard University whom Johnson taught at Morehouse. Johnson “was a primary source of the first cadre of Black political scientists in the academy,” said Thornton, 70. He also noted that most Black political scientists before Johnson’s era were considered more as philosophers, sociologists and historians. “He helped define the footprint of Black political scientists as scientists,” said Thornton, who taught seven years at Morehouse before spending some 30 years at Howard. “Dr. Johnson went about the business of producing Black political scientists,” Thornton added, ticking off a list of peers who trace their political sciences roots to audiences with Johnson. Johnson is modest when speaking of the many students he has trained, making it a point to decline offering specific names yet proudly boasting that they went on to earn doctorates at schools ranging from Harvard and Yale to the universities of Michigan and Wisconsin. Johnson remembers his humble beginnings. When his father, Tobe Johnson Sr., a Birmingham steelworker, died when Tobe Jr. was 14 years old, he and his mother, Evelyn, a homemaker, took the family baton to ensure Tobe Jr. and his brother, Adolphus, got their educations. Adolphus graduated from Fisk in 1956. Upon finishing high school, Johnson gained admission to Morehouse in 1946. Military service required him to drop out for several years, during which he was in Japan when North Korea invaded South Korea. The Air Force serviceman later completed his studies at Morehouse, graduating in 1954. Johnson said he didn’t get to know Morehouse contemporary Dr. Martin Luther King, Jr. before graduating, but they later became friendly neighbors. After graduating from Morehouse, Johnson worked a stint at Prairie View A&M in Texas before pursuing a Ph.D. in political science at Columbia. After finishing Columbia in 1963, Johnson returned to Prairie View. Soon, his Morehouse mentor, Mays, came to town for a speech at Prairie View and visited Johnson’s house for dinner afterward. Mays asked Johnson to come to work at Morehouse, where Johnson’s teaching specialties over the decades would include American politics, policy analysis and urban management. Johnson created and taught a course title “Scope and Methods of Political Analysis” for more than 50 years. The students at the prestigious Atlanta school have changed over the decades, and political science has changed even more dramatically, Johnson observed. He suggested “a judicious use of the two,” assessing one’s findings from qualitative and quantitative perspectives to gain a better understanding of patterns that may emerge. Asked about the current political landscape and his view of global affairs, Johnson said he would, if invited, advise President Trump to “listen more closely to the professionals around him” who know world political affairs better than the president does. Johnson, whose last day is June 30, said people should not assume his retirement means he will be completely gone. After a possible fishing trip to Alaska this summer, colleagues and students can expect him back in the classroom part-time in the fall.